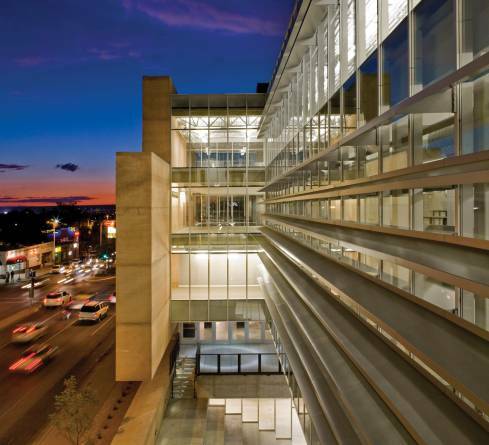 Above: Today, UNM serves more than 27,000 students on a packed Albuquerque campus that includes the ultramodern School of Architecture and Planning building, designed by Antoine Predock and Jon Anderson. Finding the broadest view of the University of New Mexico campus involves a trip up the self-service elevator to the eighth floor of the Zimmerman Library stacks. There the rows of small windows which light the floor-to-ceiling array of books look out upon a $60 million expanse of educational facilities—a 500-acre campus surrounded by the busy streets of Albuquerque and aswarm this sunny winter day with some 9,500 students preparing for semester examinations. ... The omens at birth were hardly auspicious. The Territory was poor, its population scanty and divided by lack of roads. While a 20-acre tract of prairie, worth perhaps $5 at 1889 prices, had been donated, no teachers were available. Worse, since New Mexico Territory had not a single public school, no student body was in sight to attend the college.